As the weather starts to cool just a bit, I found myself going back through old files from past Colorado adventures. One of the treks was with my best guy friend, Matt, as we camped in Lake City and Crested Butte, hiked several 14ers, endured a driving rainstorm, trekked through fields of Columbine up a Rocky Mountain pass, and back down again. It was a fun and memorable adventure. The trip started with a stop in Colorado Springs for Rudy’s barbecue. The food is not quite up to par with Texas bbcue, but it’ll do when in the Centennial State. Being the planner I am, I had brought a few bottles of Salt Lick sauce with me to Colorado, and being prepared paid off. After that, a long drive to Lake City found us setting up camp on the shores of Lake San Cristobal. With mosquitoes buzzing around like WW2 fighter planes, we rigged up the tent and tried to sleep. Not long after, though, the storms of wind, rain, thunder and lightning, left us wanting for sleep. I made a break for the car and spent the rest of the evening in the back of my 4-Runner. After a dismal night of sleep, we drove the 14 or so miles to the Silver Creek trailhead. The hike up to Redcloud Peak (14,034’) gains about 3700’ over 4.5 miles. The trail is beautiful, and in the summer wildflowers spring up along the creek. Atop Redcloud, the iron-laden rock and dirt appears as a dark orange – fairly unique for high mountain tops. A hiker slogs up the slopes of Sunshine Peak after making the traverse from Redcloud Peak. These two beautiful 14ers are located near Lake City, Colorado, and make for a great way to spend the morning. But this was not our final goal, so we made the easy traverse over to Sunshine Peak (14,001’). The trail is easy to follow and gives you another 1.5 miles and 550 vertical feet. The views north from Sunshine Peak are an amazing sight, indeed. Uncompahgre Peak (14,309’), Wetterhorn Peak (14,015’), and Redcloud are all in the same view. In all, we covered about 11+ miles and 4700 vertical feet. While the skies were patchy blue on top, by the time we approached our car, the bottom dropped out of the clouds and the rains again came down hard. Fortunately, we scrambled to our car and avoided a total soaking. We did pass several folks on their way up when we were near the end of the trail close to the trailhead, and felt somewhat badly because they had to be soaked. On the other hand, no one should be starting a 14er so late in the morning, especially in the summer months! Next up, we drove to Crested Butte, but not before stopping in Gunnison for a chicked fried steak dinner. With bellies full, we slept a bit better than the previous evening, awoke early the next morning, and made our way over a still somewhat snowy Gothic Road 14+ miles to Schofield Pass. The trailhead starts at a large turnout and we were the first ones to head out (it was still dark outside). 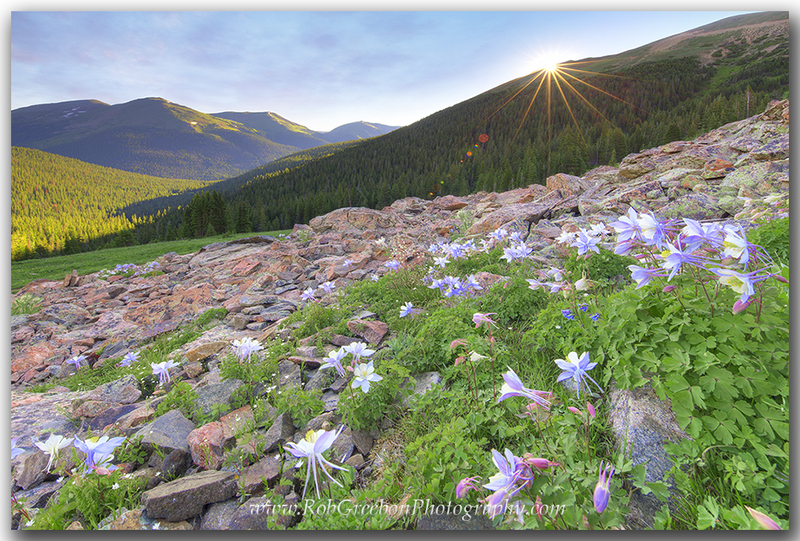 By the time daylight approached, we could tell there were wildflowers along the path, and as the sun broke over the ridge, the blue petals of Columbine were evident. Our goal was West Maroon Pass, a notch in the rock that divides the Aspen area from Crested Butte. The trail is about 8 miles round trip and covers about 2700 vertical feet – a nice respite after logging a lot more the morning before. The views were magnificent and the wildflowers amazing. The last set of switchbacks to the top of the pass brought out my acrophobia just a bit, but I’ve come a long way fighting my fear of heights. This path’s drop-off, while easy to some, was just another mental challenge for me. And I know it is all in my head – the physical part isn’t an issue. Mind over matter; one foot in front of the other. When I was younger, I loved to go skiing in the winter. We’d leave our warmer confines in Texas and head to the mountains, making a long (and usually overnight) drive so we could maximize the time spent on the snowy slopes. I even wondered why folks would want to come to Colorado in the summer! Yes, I was young and naive. Now, the times have flipped, and I don’t like being cold! I love summers in the mountains, and my family makes our home base in Winter Park, Colorado. And while my photography business takes me to different parts of the Rocky Mountain state, the Fraser Valley and Grand County are still the areas I call my home away from home. And Winter Park offers many activities for my family and me, as well as photographic opportunities at sunrise and sunset (and even during the day). My oldest daughter (8 years old) is learning to fly fish, and starting to enjoy the art of catching a fish on a fly (as opposed to a spin rod that she thinks is “boring.”) Gotta say, that’s my girl! If I’m not fishing with a fly rod, I’d probably just as soon not fish. At the same time, both daughters enjoy strolling down the Fraser River Trail. There are some portions of the river that have nice sand bars with plenty of smooth rocks for skipping. We’ve been entertained for hours with just throwing rocks in the river and building sand castles. It is not a bad way to spend an afternoon. Between the Winter Park ski base and Fraser, Colorado, the Fraser River trail offers 6 miles of beautiful scenery to enjoy. Whether biking or walking, this path takes you along the Fraser River, though the town of Winter Park, and onto the less-touristy town of Fraser. Heading south and uphill from the Winter Park and Mary Jane ski areas, Berthoud Pass offers some nice areas for hiking. Trails that follow First Creek and Second Creek take you uphill towards Vasquez Ridge, and at the top of Berthoud Pass, the remnants and trails of an old ski area let you make the hike up to Colorado Mines Peak, the first of several peaks that stretch along the Continental Divide. If you want to bag a few 13ers, this is a beautiful hike that affords vast views of the surrounding valleys. But we wary – nearly all of the hike to Mount Flora, Mount Eva, and over to James Peak is above tree line. If storms come up, you have very few escape routes. So start early and enjoy the mountains! From just beneath the Colorado Mines Peak near Berthoud Pass, this mountain landscape view looks across to Mount Flora (13,146′). The trail follows the CDT (Continental Divide Trail) and takes you well above timberline across several prominent peaks. This hike makes for an easy daytrip from Denver or Winter Park and the Fraser Valley. 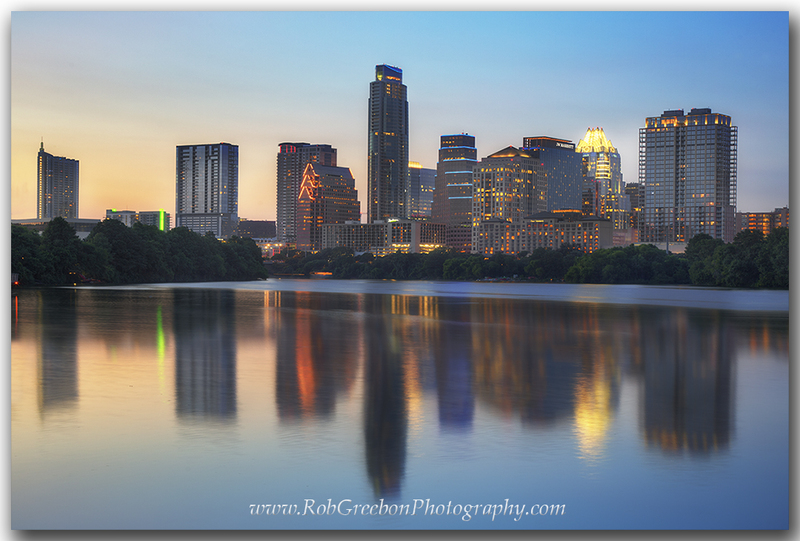 I arrived early and enjoyed a magnificent sunrise on this July morning. Heading in the opposite direction from Winter Park, the town of Fraser offers nice areas to bike and hike. And if you want to summit one of the more well known peaks in the Fraser Valley, Byers Peak is waiting. Although it doesn’t reach 13,000 feet (just under), it is still a beautiful hike – and not too difficult. The altitude gain is below 3,000′ and in summer the wildflowers bloom along the trail. And like the hikes from Berthoud Pass, start early and avoid the afternoon thunderstorms. After all the outdoor activities available, you’ll probably work up an appetite! Our favorite pizza is the less heralded Elevation Pizza. While most folks think Hernandos is the best, over the years we’ve grown to like Elevation a little better. But with all the restaurants to choose from, you’re bound to find something that fits your fancy. I love our time in Winter Park. It always goes by too fast. I was at the Maroon Bells! I recently headed to the Maroon Bells Wilderness Area with a lifelong friend this past week. 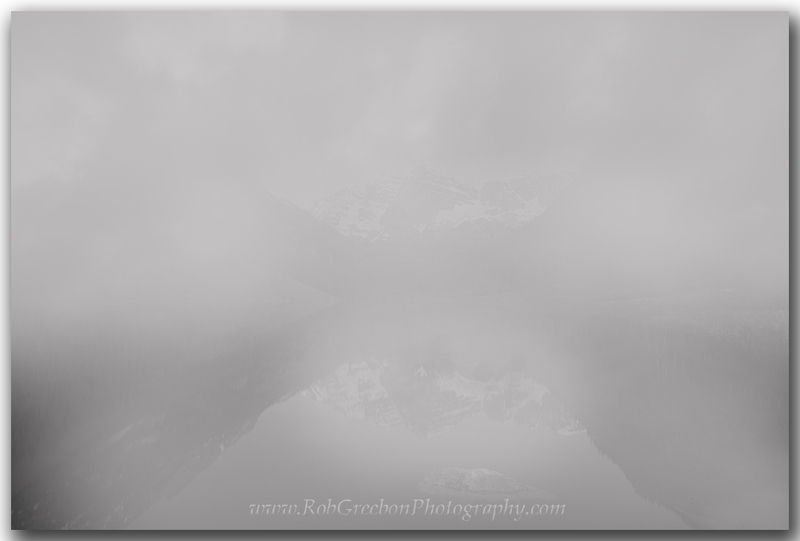 I had hoped to photograph the area and add to my Maroon Bells portfolio. The weather forecast was not great, but I’d seen worse and still ended up with some great sunsets. So we met along I-70 and drove west through Vail, Eagle, and Glenwood Springs. Along the way, since we were ahead of schedule and the skies were great, we decided to take an excursion to Rifle Falls State Park. Neither of us had been to this small park, so we wanted to check it out. About 20 minutes past Glenwood Springs heading west, we turned north at Rifle and then drove another 20 minutes to the park. 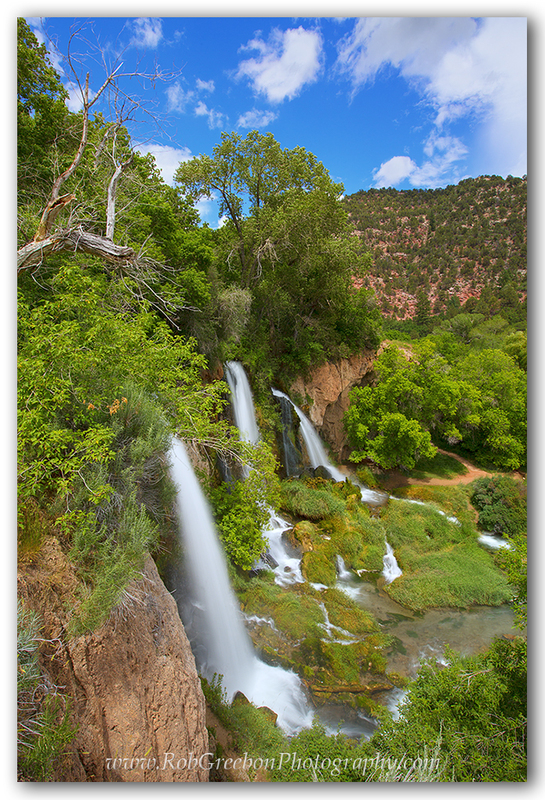 Plunging 70 feet into a green, fertile valley, Rifle Falls is a beautiful waterfall just north of Rifle, Colorado. It is a small state park, and the area provides a great place to explore if you have a free hour or two. While not big, this little park offers a view of three separate waterfalls that plunge 70 feet and converge into a green, lush valley. A trail makes a loop around the falls – up and over and back down. It is short (maybe a mile), easy, and offers visitors to Glenwood Springs a nice excursion if you have a few hours to kill and the weather is good. With a three-forked waterfall flowing over the cliff, the color green stretched as far as you could see at Rifle Falls State Park near Rifle, Colorado. This 70-foot waterfall is the centerpiece of this small park and offers a trail that takes you to the top of the falls for a bird’s-eye view. Next, we headed to Rifle, stopping to eat at a local establishment before driving back to Glenwood Springs, down to Carbondale, then on 82 heading to the Snowmass/Aspen area. We drove up to Snowmass Village, checked into our room, and then, since the weather was still ok, drove the 35 minutes up to the Maroon Bells. While driving the final 10 miles or so the clouds rolled in. We pulled into the parking lot and decided we didn’t mind a little sprinkle, then began a short walk around the lake loop. (We had planned on hiking to Maroon Pass, a 13 mile round trip, the next morning at sunrise). For now, we just wanted to be outdoors. The view from where you begin this walk is amazing. The two 14,000 foot peaks of Maroon and North Maroon rise above Maroon Lake and provide one of the most grand views of Colorado – and I think the most photographed of any location. This is an image from last year. 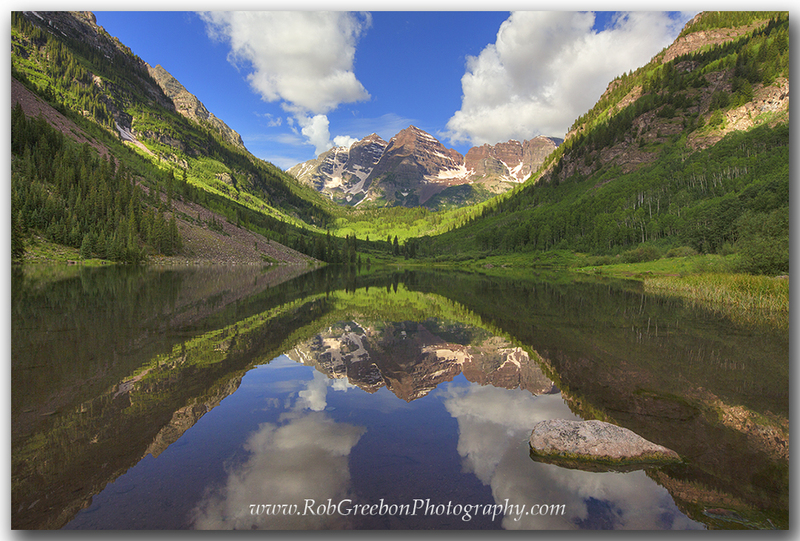 The Maroon Bells on a perfect summer morning – taken in 2014. However, the peaks were hidden in a thick fog. Every once in a while, we’d see a blurred outline of something in the distance. The Maroon Bells on a foggy, gray, rainy evening. Unfortunately, this is the most of the Bells we saw in two days during the summer of 2015. About 50 yards into our walk, the rains picked up. No matter, it wasn’t bad. We continued on. A minute later, the bottom fell out. We turned and walked back to the car. We are optimists. We sat in the car for another hour and a half, thinking the deluge would pass by. Finally, near dark, we returned to the room, but not before trying to find something to eat. Everything was closed. The evening was a complete wash, literally. I set my alarm for the next morning at 430am. When I awoke a little before the alarm, I went outside to find the rains just as we had left them – very active. So I checked again at 530am, then 630am. (As a sidenote, my buddy and I had both played college tennis, so we figured at least we could watch a little Wimbledon on the hotel TV, but even those matches were rained out). Since this trek was for hiking and photography, we finally bailed on our plan and decided to head back towards Denver. Along the way, we’d find another hike. We passed Hanging Lake, a beautiful waterfall at the end of a mile-long uphill climb (it was raining when we passed by the exit). The we passed through Vail – still raining. Next, the rains followed us through Frisco and Dillon. I finally dropped off my friend at his car and drove back to our place in Winter Park. The short trip was a bust. And it still rained all night. Oh well… the weather doesn’t always cooperate. Next week, we’ll try again! 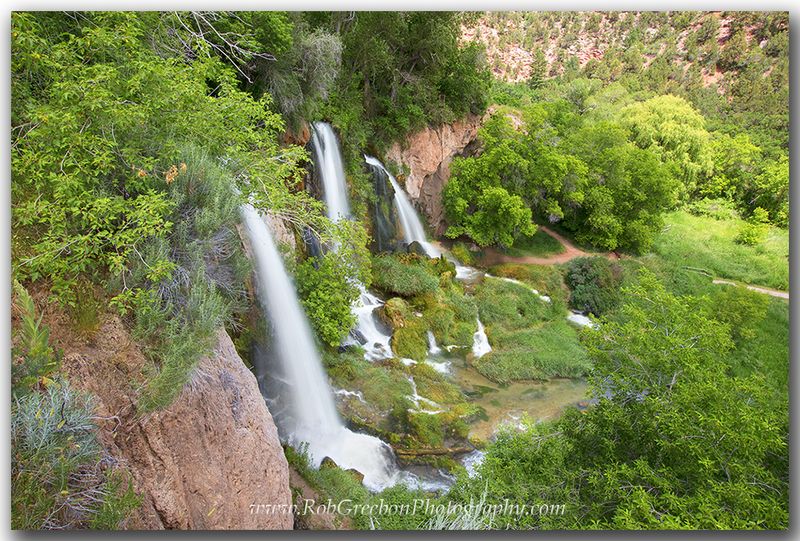 Feel free to visit my Colorado galleries for more (and more colorful) photography.